The little details at your wedding matter and make your day memorable. The question of who lifts the bridal veil is one such detail that can be easily overlooked. Even though you have envisioned your wedding ceremony since you were a little girl, you may forget to choreograph small details such as lifting the veil. On my wedding day, I realized about 5 minutes before the ceremony that I was not sure who was supposed to lift my veil – my dad or my husband-to-be. After all, movies can only inform us to a certain extent! Back in early Roman and Greek times, the bride wore a veil to protect herself from any evil spirits. As customs progressed in Europe, and many marriages were arranged, the bride wore a veil to conceal her face from the groom. The thinking was that the groom wouldn’t change his mind at the last moment from the first look of her overwhelming beauty. Quite the surprise that must have been! The most common method is for the father to raise the blusher of his daughter’s veil when they reach the altar, and then hand her off to the groom. The second option is to leave the veil down during the entire ceremony until pronouncement of husband and wife. 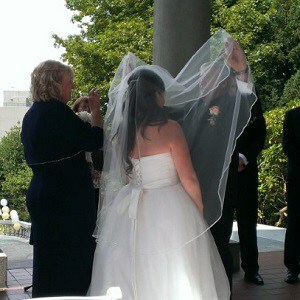 The groom then lifts the veil and kisses his bride. Since most guests are used to seeing the bride’s veil lifted when she reaches the altar, they may find it strange that your veil is down during the entire ceremony. As you can see from the photos above, it was quite the impromptu moment. We had a few forces against us such as wearing heels, my father and I being the same height, not practicing, and only having 5 minutes to prepare. I honestly can’t remember some moments of the wedding ceremony, it was nerve-racking. From my wedding photos it appears that my father and I knew what we were doing, and that is all that matters. Overall, I think we did a pretty good job at unveiling the bride!